This was taken Sunday night. I checked it this morning and I was still top 10% but they'd broken tier 6 with close to 48 hours still left, so I hauled my type 9 back to Brestla. Still time to get in on it if anyone is interested. rewards are turning out to be pretty decent. Its always worthwhile to get some time in on community goals. It breaks up the boredom that can develop by being in one area. 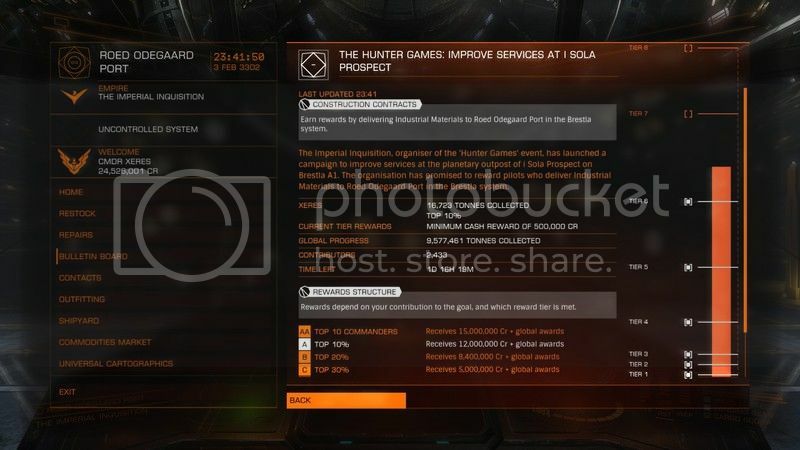 And hopefuly Fdev use the templates and stats from all of these CGs in future smaller scale local community goals for example allowing us to upgrade san. 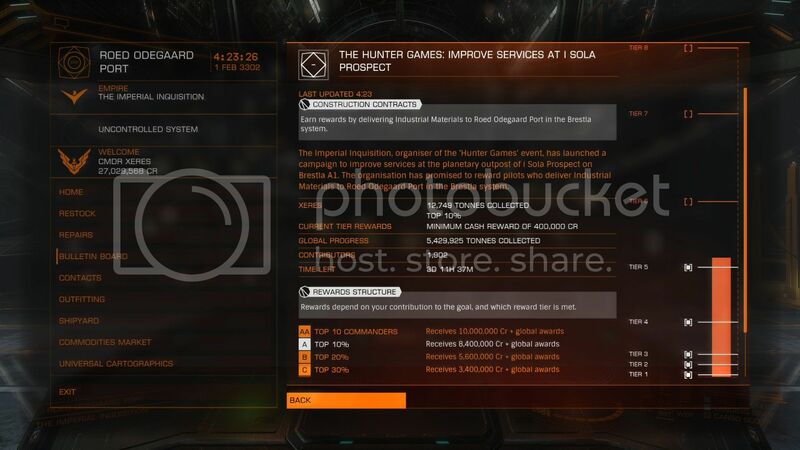 Longer term if we can get enough overall player activity in san and the surrounding 30-40ly of connected systems, we might eventually get a community goal. This is outside of our meta alloy / unknown artifact experiments with various local stations - which ie pic tok may eventually lead to a shutdown. If anyone wants to help the UA run from hip 18987 to iapodes still needs extra deliveries. Send totals collected and stations delivered to liberty. I'm just fulling a request from mccaslin for some details on this CG's status. 36 hours to go, it might break tier 7. it moved past tier 6 waaaay more than I expected in the last 2 days. I wonder how much of the progress = Imperial Inquisition members?